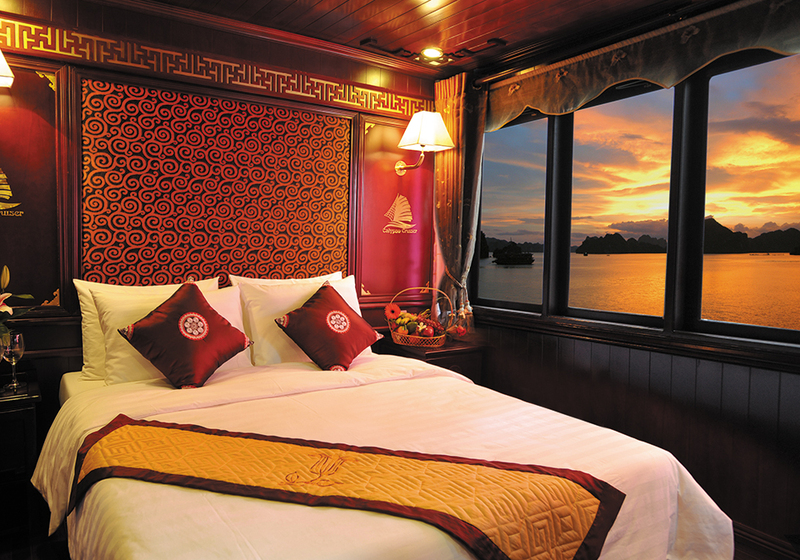 Inspired by the traditional and classical beauty of ancient junks of Ha Long Bay, Victory Star Cruise was designed in respect of traditional features but equipped in modern and luxury style. 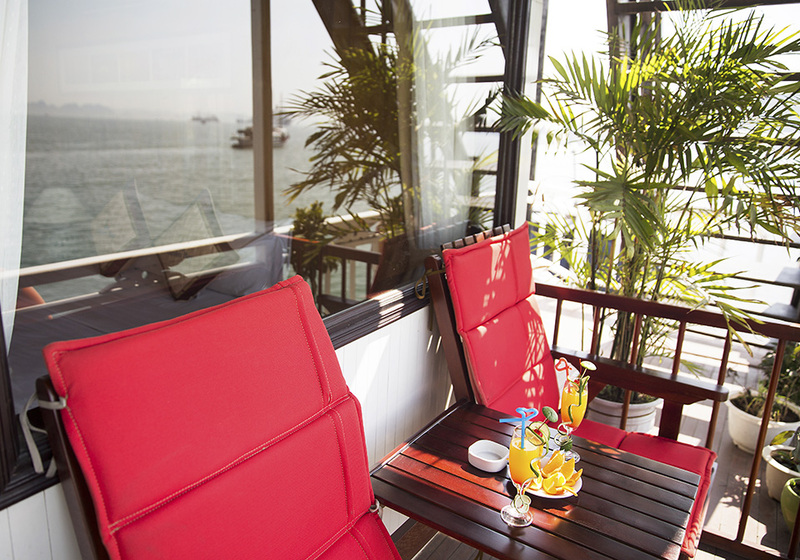 Victory star cruise is one of the best cruises on Halong Bay. 11:30 – 12:15: Arrival at Hon Gai International Harbour. 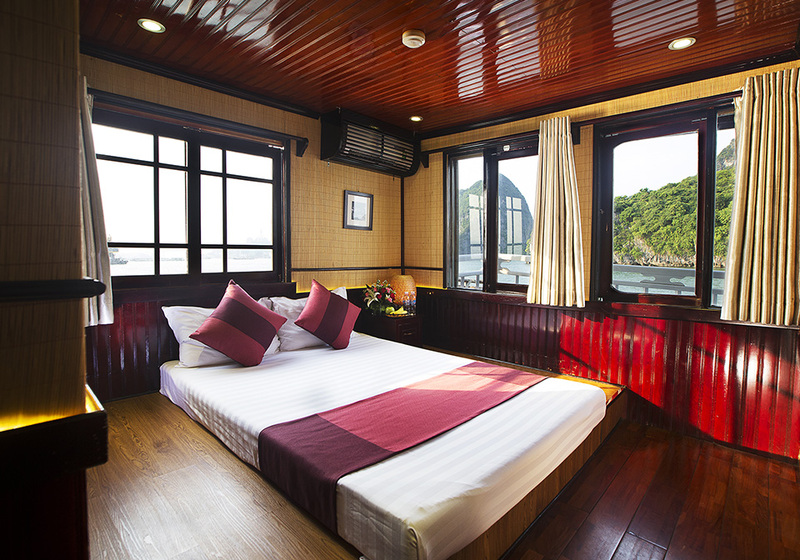 12:30 – 13:00: Transfer by tender to boat, enjoy Welcome Drink, Depart to Bai Tu long Bay. 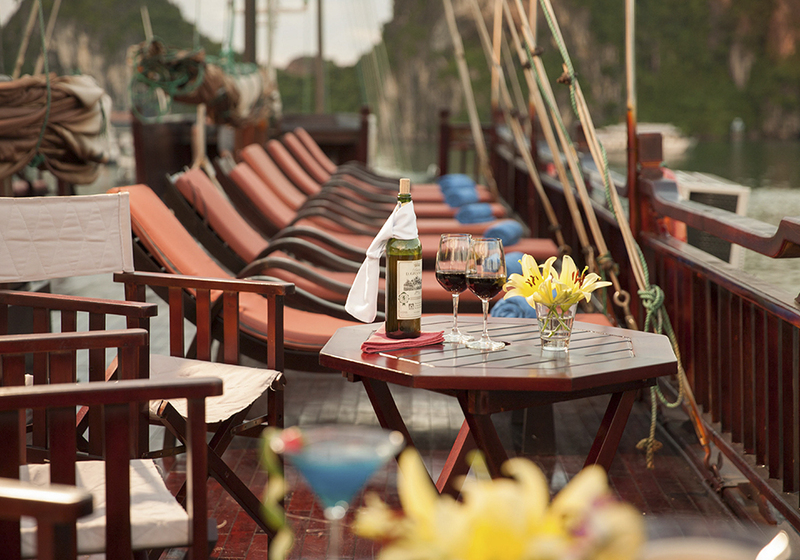 13:00 – 14:30: Enjoy Lunch while cruising to magnificent Bai Tu Long Bay, admire the fascinating formations on the way. 15:30 – 16:30: Transfer from boat to rowing boat to visit Vung Vieng Fishing Village. Rowers are local people wearing traditional costume. It’s the opportunity to see the fisher’s daily life with the primary features in the charming nature. 17:30: Return to boat – Continue cruising through the bay. 18:30: Anchor for overnight at Cong Do area. 18:30 – 19:00: Cooking Demonstration in restaurant. 19:30 – 21:00: Savor a delicious Set Dinner in dinning room. 21:00 – 22:30: Activities: Relax on deck, Beauty Spa services, drink service available or night time fishing. 23:00: Relax, enjoy fresh air & overnight on board. 06:30: Enjoy sunrise over the Bay or take part in our morning Tai Chi session. 06:45 – 07:45: Coffee, tea and breakfast pastries served in dining room. 08:00 – 08:30: Explore the well- hidden Thien Canh Son cave. 09:30 – 10:30: Having international Buffet Brunch served in dining room. 10:30 – 11:00: Arrival at the pier. Farewell. Meals on board are fusion. Vietnamese, seafood and international. Guest should advise of any special food reference, allergies or dietary requirements at least 1 week prior to the cruise date. 19:30 – 21:00: Savor a delicious Set Dinner in dining room. 08:00 – 8:30: Full Breakfast will be served in dining room. 08:30 – 09:00: Pack lightly; swimwear and a set of clothes. Towels will be provided. As there are different activities during the day please bring both shoes and flip-flops. 09:00: Transfer by tender to the “Day Boat”. Begin to cruise to some of Bai Tu Long Bay’s more Untouched Locales. Exact locations depend on tide conditions. 09:30 – 16:30: Enjoy a leisurely day of Sightseeing and Swimming. A multi- course Lunch will be served mid-day. 16:30: Return to Victory boat. 18:30: Cooking demonstration in the restaurant. 19:30 – 21:00: Savor a delicious Set Dinner in the dining room. 21:00 – 22:30: Activities: Relax on the deck, Beauty Spa services, drink service available or night time fishing. 06:30: Enjoy the sunrise over the Bay or take part in our morning Tai Chi session. 06:45 – 07:45: Coffee, tea and breakfast pastries served in the dining room. 08:00 – 08:30: Explore the well-hidden Thien Canh Son cave. 09:30 – 10:30: Having international Buffet Brunch served in the dining room.